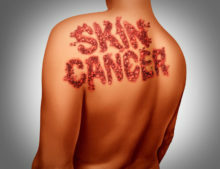 Nearly half of all Americans who live to the age of 65 will develop some type of skin cancer. Almost all of them, if diagnosed and treated early, will be cured. If not, all three types of skin cancer—melanoma, basal cell carcinoma, and squamous cell carcinoma—can be disfiguring and/or deadly. 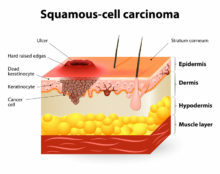 The Rochester (MN) Epidemiology Project showed that diagnoses of squamous cell carcinoma (SCC) in the U.S. increased by 263 percent from the first recording period 30 years ago to the most recent decade recorded, 2000-2010. More than one million cases are reported each year.